Mixed Greens have been a staple item on Southern dinner tables for decades. Collards, along with Kale, Mustard Greens and Chard fill a very necessary role in proper nutrition providing Vitamins A & C along with Selenium and a whopping 25% your daily fiber (5.3g). 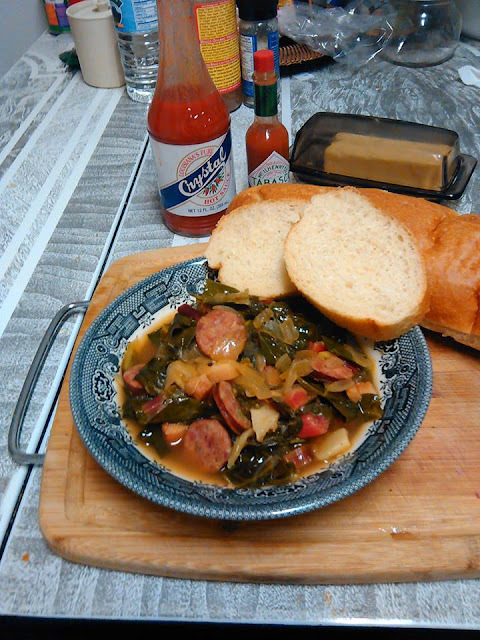 I have cooked green this way for years never really realizing that it is a traditional Creole Recipe dating back to the 1800's. I've modified the recipe to reduce the sodium per serving. The liquid on the bottom of the pan is called "pot likker" and is full of nutrients. This dish is served with bread used to sop up the juices or my wife likes to have it over rice.